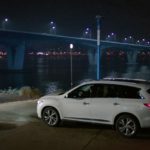 Manager Kong Hyuk-joon (Oh Eui-sik) brings Oh Yoon-seo (Yoo In-na) here in his car in episode 3 of Touch Your Heart/Reach of Sincerity (진심이 닿다) (tvN, 2019) so that she can cry freely and get her frustrations out. Emperor Lee Hyuk (Shin Sung-rok) meets upon with his brother Yi-Yoon (Oh Seung-yun) here to confront him about what he knows about his ex-wife’s death in episode 36 of The Last Empress/Empress’s Dignity (황후의 품격) (SBS, 2018-19) while his bodyguard Na Wang-sik (Choi Jin-hyuk) is in standby. 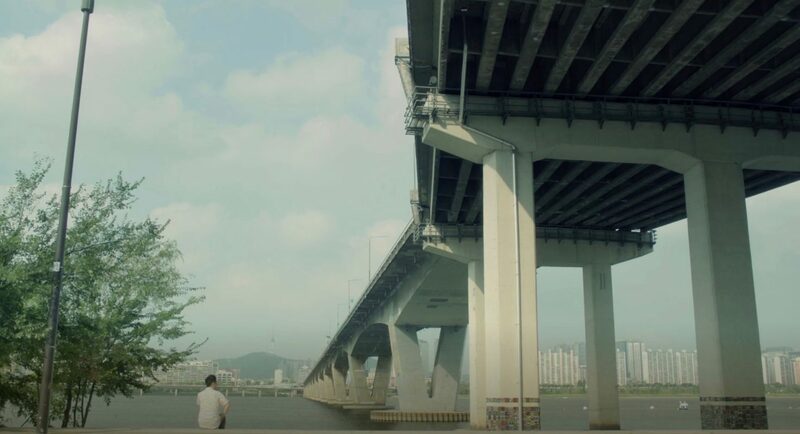 Kang Joon-hyuk (Sung Hoon) broke up with Jin Se-ra (Lizzy of After School) gat the feet of this brigde — as seen in a flashback — in episode 10 of I Picked up a Star on the Road/I Picked Up a Celebrity from the Street (나는 길에서 연예인을 주웠다) (Oksusu, 2018) because she cheated on him. Kwon Young-sil (Seo Yi-sook) meets here with ‘The Voice’ in episode 17 of Terius Behind Me (내 뒤에 테리우스) (MBC, 2018) and later, in episode 7, Jin Yong-tae (Son Ho-jun) gives his previous secretary Park Soo-il (Lee Hyun-geol) a money gift here for his services. Troubled Lee Baek-man (Jang Hyun-sung) comes here in episode 3 of Twelve Nights/12 Nights (열두밤) (Channel A, 2018) and gets a call from Yoon Chan’s (Hwang Jae-won) dad — in the year 2010. 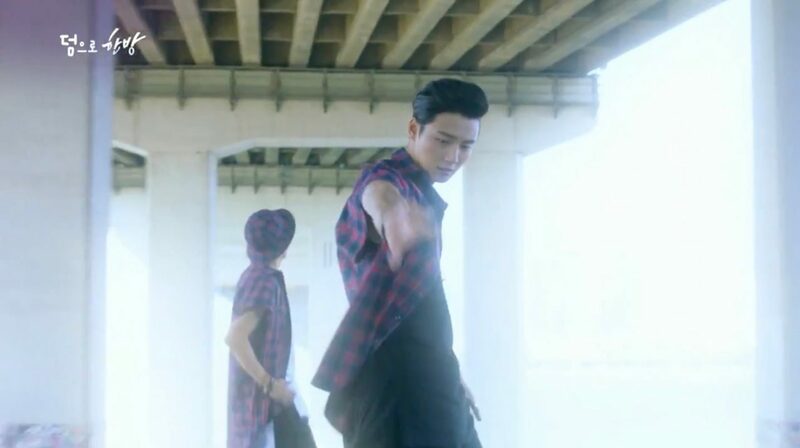 Later, in episode 5, he comes back here to teach his son Yoon Chan how to ride a bike. 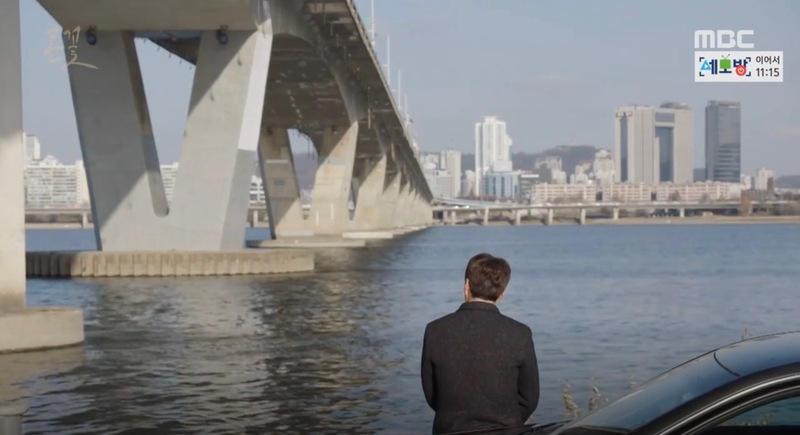 Choi Kang-seok (Jang Dong-gun) meets with his all-time opponent David Kim (Son Seok-koo) who gives him evidence for a case in episode 15 of Suits (슈츠) (KBS2, 2018) at the foot of this bridge. 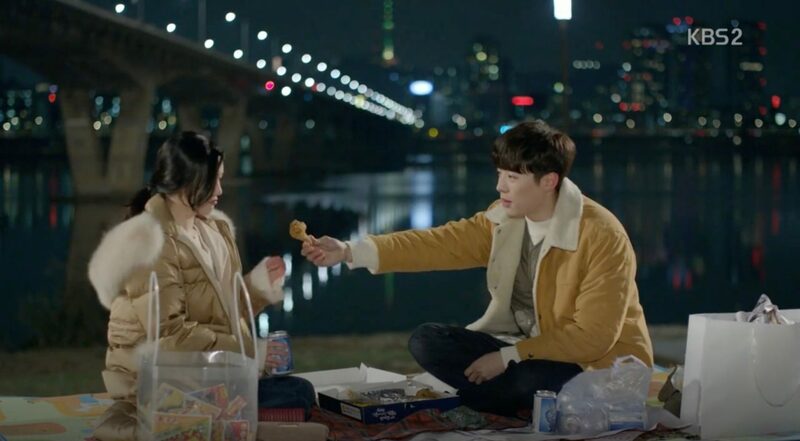 Seo Ji-ho (Shin Hyun-soo) invites Choi Seo-hyun (Lee Da-in) here to have chicken and beer together in episode 30 of My Golden Life (황금빛 내 인생) (KBS2, 2017-18) right after her graduation concert, to which nobody from her family came. 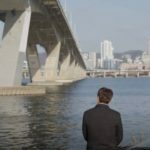 Jang Boo-cheon (Jang Seung-jo) comes here and tries to kill himself halfheartedly (the warmers just too cold) after her heard that his father is not his father just before in episode 8 of Money Flower (돈꽃) (MBC, 2017-18). 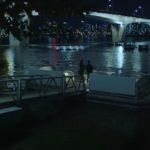 In episode 13 of Because This Is My First Life/This Life Is Our First (이번 생은 처음이라) (tvN, 2017), this is where Woo Su-ji (Esom) and Ma Sang-goo (Park Byung-eun) went to discuss their misunderstandings. 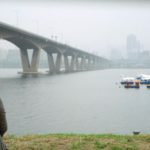 It is underneath this bridge that Han Woo-Tak (Jung Hae-in) and his colleague arrest a supposed phone dealer (but he got the victim) in episode 25 of While You Were Sleeping (당신이 잠든 사이에) (SBS, 2017). 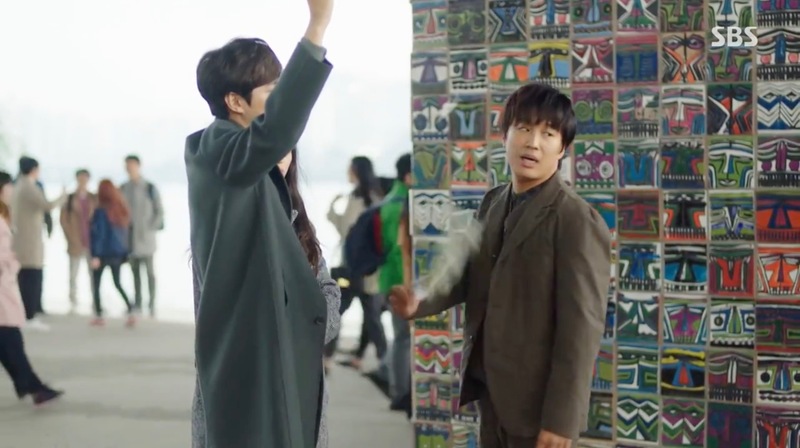 Yoo Eun-Ho (U-Know Yunho of TVXQ), just having been dumped, comes here in episode 1 of Meloholic/Melo Holic (멜로홀릭) (OCN, 2017) and meets Han Ye-ri (Kyung Soo-jin) here for the first time. She came here for the same reason. 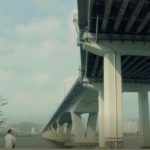 They drink together and Eun-ho is woken up by the cleaning man underneath the bridge the next morning. 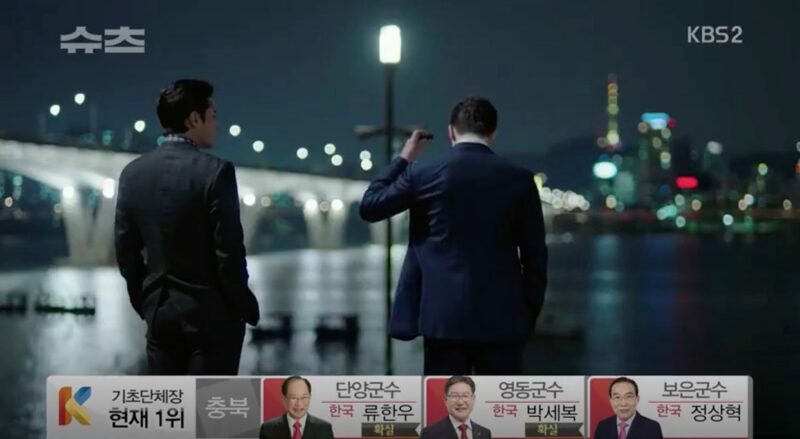 In episode 2 of Mad Dog (매드독) (KBS2, 2017), manager Choi Kang-woo (Yoo Ji-tae), assistant manager Park Moo-shin (Jang Hyuk-jin) and newbie claims examiner Park Jae-soo (Yoon Jong-seok), all working for Taeyang Insurance, went here to secretly take a photo of Go Jin-chul (Park Sung-hoon), an insurance scammer. 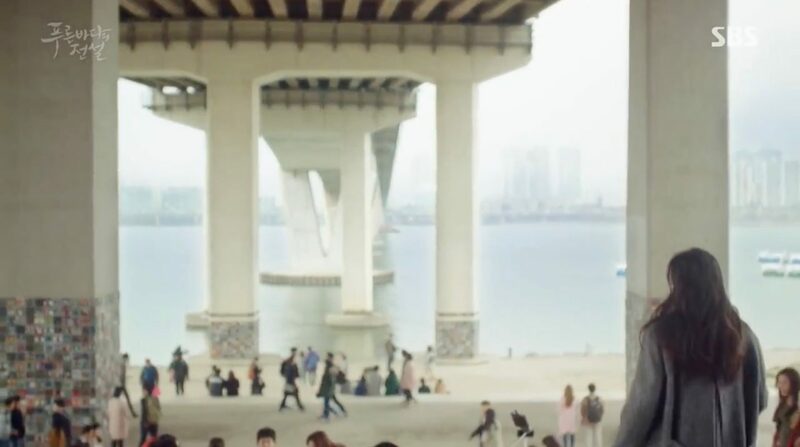 On Jung-sun (Yang Se-jong) and Lee Hyun-soo (Seo Hyun-jin) stretch underneath the bridge after a jogging in episode 7 of Temperature of Love (사랑의 온도) (SBS, 2017). 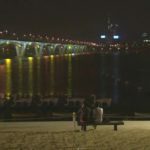 Afterwards they sit down with a drink and Hyun-soo plays an Amy Winehouse song to explain her view on love. 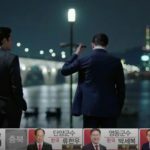 After resigning to SMT Restaurant, Sung Hae-sung (Yeo Jin-goo) and Mr. Cha (Ahn Jae-hyeon) make a new business in episode 22 of Reunited Worlds (다시 만난 세계) (SBS, 2017). They first open Cha Pasta Truck here, underneath the bridge. Na Young-sil (Kim Hae-sook) comes here in episode 38 of Father Is Strange (아버지가 이상해) (KBS2, 2017), right after she has revealed the truth to Ahn Joong-Hee (Lee Joon) about the stolen identity. 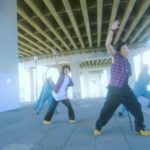 Flashback to the 1990s at the end of episode 16 of The Best Hit (최고의 한방) (KBS2, 2017): J2’s MV for “Say It” was filmed here. 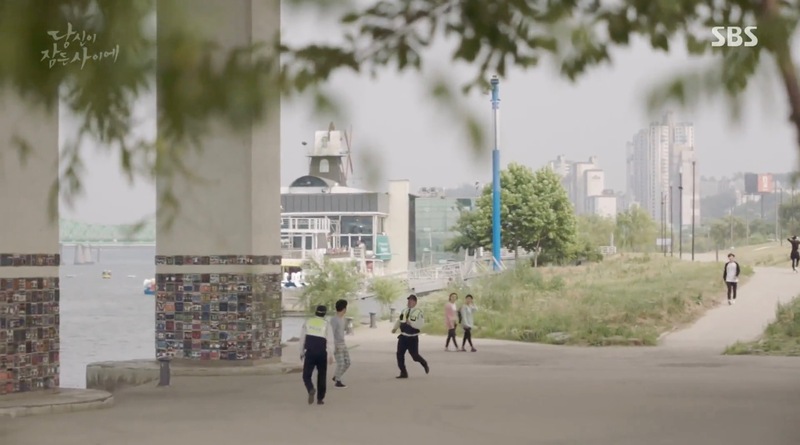 Kim Bok-joo (Lee Sung-kyung) comes here, when frantically looking for Jung Joon-hyung (Nam Joo-hyuk) in episode 15 of Weightlifting Fairy Kim Bok Joo (역도요정 김복주) (MBC, 2016-17); she thought he might have committed suicide here. 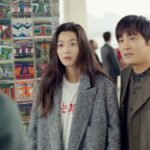 Sim Chung (Gianna Jun) ends up here when following Heo Joon-jae (Lee Min ho) in episode 4 of The Legend of the Blue Sea (푸른 바다의 전설) (SBS, 2016-17). 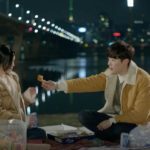 He saves her from a con man, they watch a firework festival together afterwards and after hesitating Joon-jae takes Chung to his home. 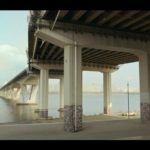 In episode 4 of Another Miss Oh/Another Oh Hae Young (또 오해영) (tvN, 2016), Park Do-kyung (Eric) and Oh Hae-young (Seo Hyun-jin) stop by a pojangmacha next to this bridge to have dinner; right after having been to Eungbong Mountain Park. 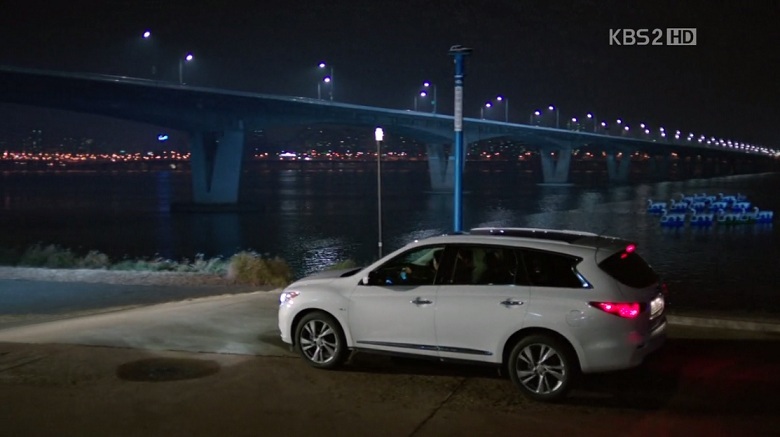 This is where Park Ha-na (Park Ha-sun) goes after she realizes she has a crush on Jin Jung-suk (Ha Seok-jin) who had just abandoned her on the bridge and Hwang Jin-Yi (Hwang Woo Seul Hye) comes to pick her up in episode 9 of Drinking Solo (혼술남녀) (tvN, 2016). 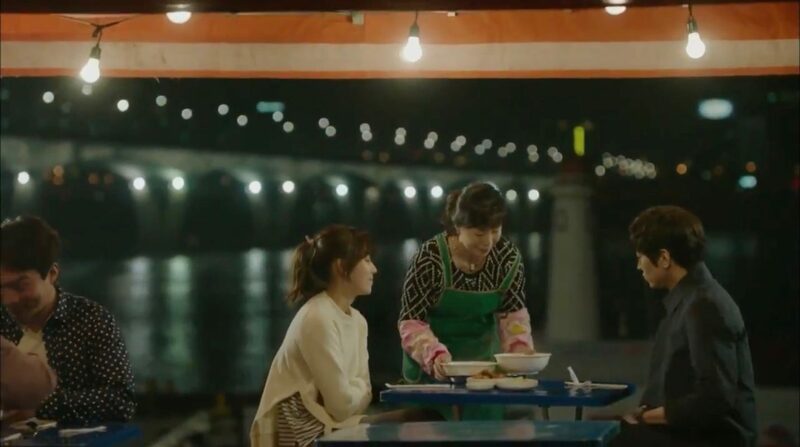 Here is where Na Min-soo (Ko Se-won) takes Lee Eun-hee (Kim Ji-young) on a date in episode 26 of Here Comes Love (사랑이 오네요) (SBS, 2016). 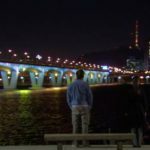 This is where Kang Hyun-bin (Ahn Jae-hyeon) asks Eun Ha-Won (Park So-dam) to be her fiancee for three hours in episode 1 of Cinderella and Four Knights (신데렐라와 네 명의 기사) (tvN, 2016). 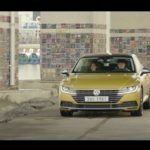 This is where Ji Sung-joon (Park Seo-joon) first meets Kim Hye-jin (Hwang Jung-eum) after having found out her true identity in episode 11 of She Was Pretty (그녀는 예뻤다) (MBC, 2015) [Exact geolocation: 37.523648, 126.940007]. 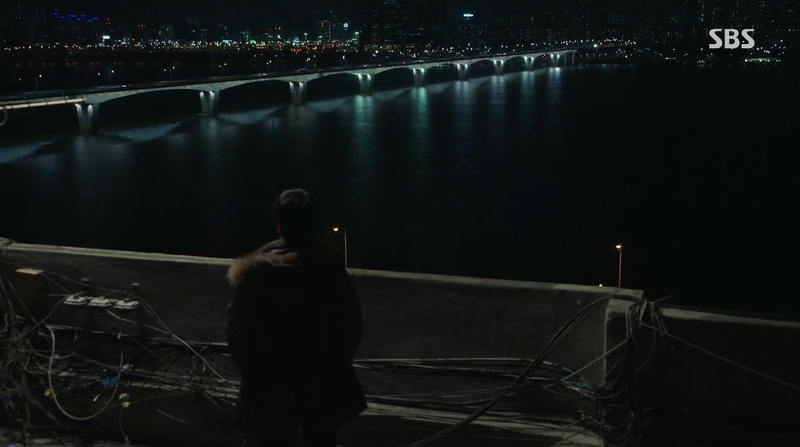 Ki Ha-myeong (Lee Jong-suk) and Choi In-ha (Park Shin-hye) see this bridge from the rooftop they always hang out as in episode 4 of Pinocchio (피노키오) (SBS, 2014-15). 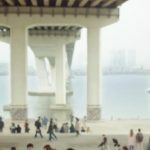 This is where Kang Ma-roo (Song Joong-ki) takes Seo Eun-gi (Moon Chae-won) after he let the wedding fall through at the end of episode 17 of Nice Guy/The Innocent Man (세상 어디에도 없는 착한남자) (KBS2, 2012). 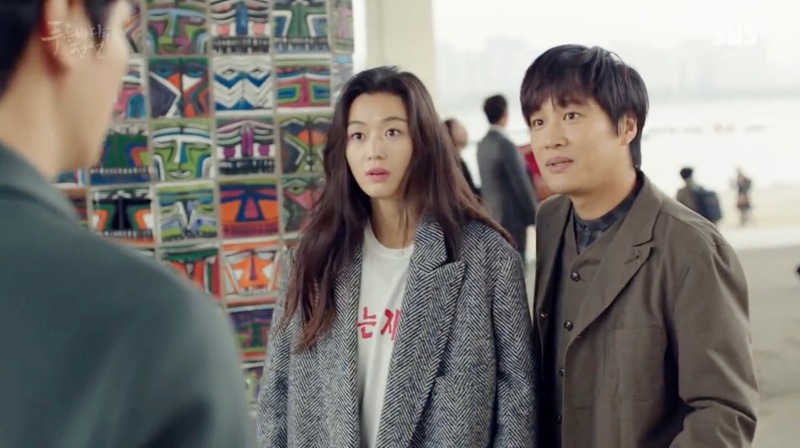 Hwang Tae-pil (Yeon Woo-jin) and Jung Yoon-sook (Jo Mi-ryung) break up here in final episode 58 of KBS2 Ojakgyo Brothers/Ojakgyo Family (오작교 형제들) (KBS2, 2012) and promise each other to meet up two years from now. 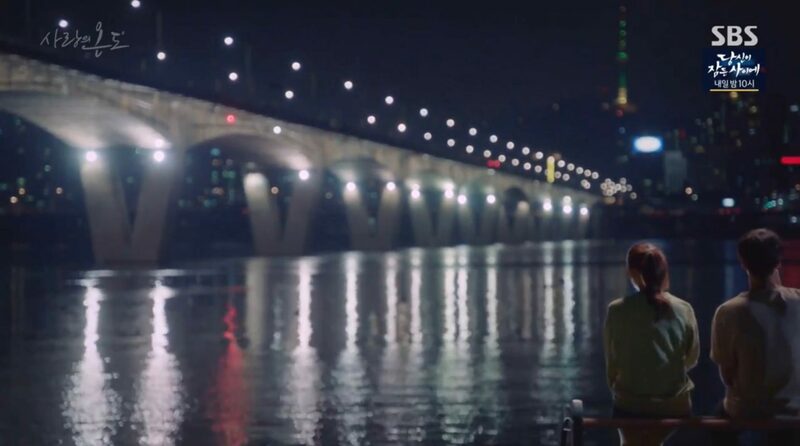 Choi Sang-hyun (Kim Ju-hyeok) and Yun Jae-hee (Jeon Do-yeon) come to the feet of this bridge right after she has broken off her marriage with Ji Yeong-woo (Kim Min-jun) which was supposed to be the day after in episode 17 of Lovers in Prague (프라하의 연인) (SBS, 2005). 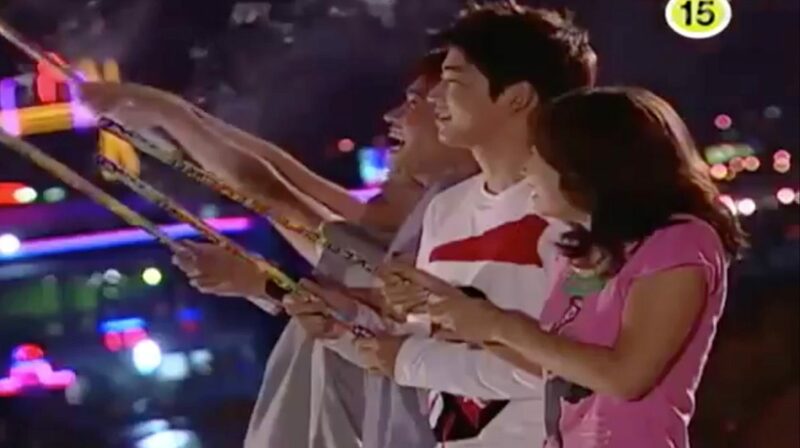 In She Is Nineteen/My Sister-in-Law is 19/My 19 Year Old Sister-in-Law (형수님은 열아홉) (SBS, 2004), Kang Seung-jae (Yoon Kye-sang) and his brother Kang Min-jae (Kim Jae-won) go here for a drink in episode 1. 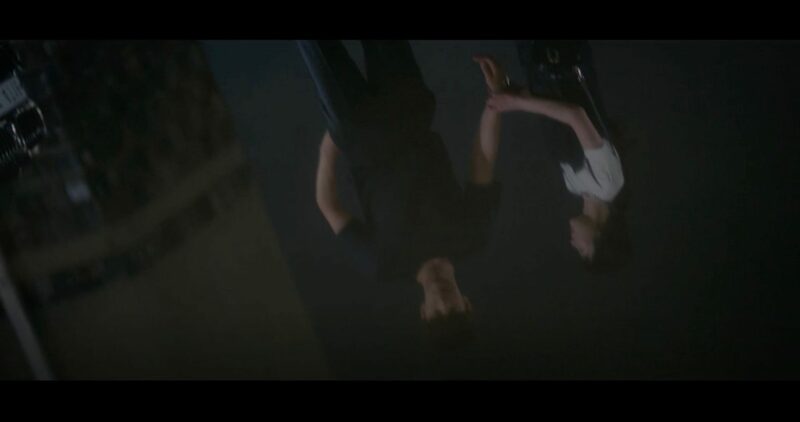 In episode 8, we see Min-jae back here, this time with Han Yoo-min (Jung Da-bin). 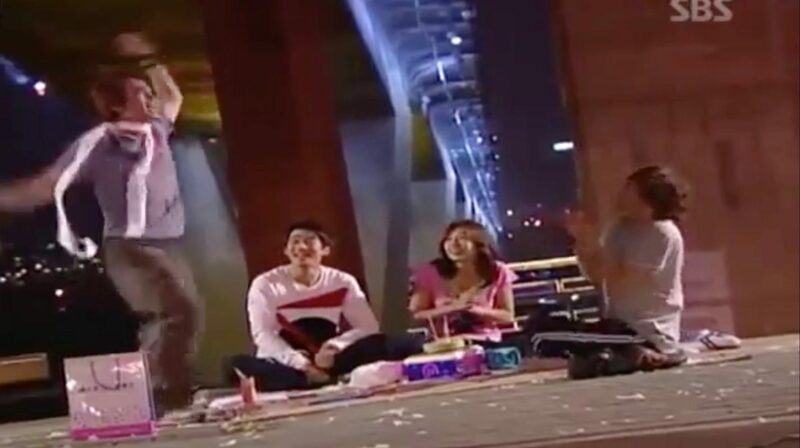 And in episode 11, everyone celebrates Yoo-min’s birthday; eating a cake and shooting firecrackers. 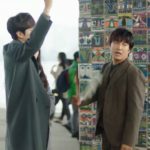 Also seen in episode 43 of Glorious Day (기분 좋은날) (SBS, 2014); in episode 9 of My Secret Hotel (마이 시크릿 호텔) (tvN, 2014); in episode 15 of Scent of a Woman (여인의 향기) (SBS, 2011); in episode 13 of Witch Amusement/Witch Yoo Hee/A Witch in Love (마녀유희) (SBS, 2007); Two End Nine Outs/Two Outs in the Ninth Inning/9 End 2 Outs (9회말 2아웃) (MBC, 2007). 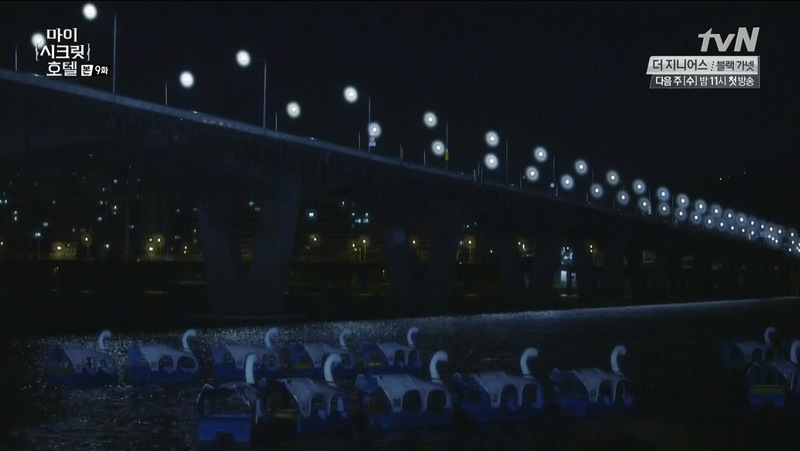 Wonhyo Bridge [원효대교] is easily recognizable by its colorful tiles and its triangle shape. 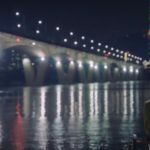 One end of the bridge is situated in Yeoiudo Hangang Park [한강사업본부 여의도안내센터], where the K-Dramas scenes featuring the bridge are filmed. 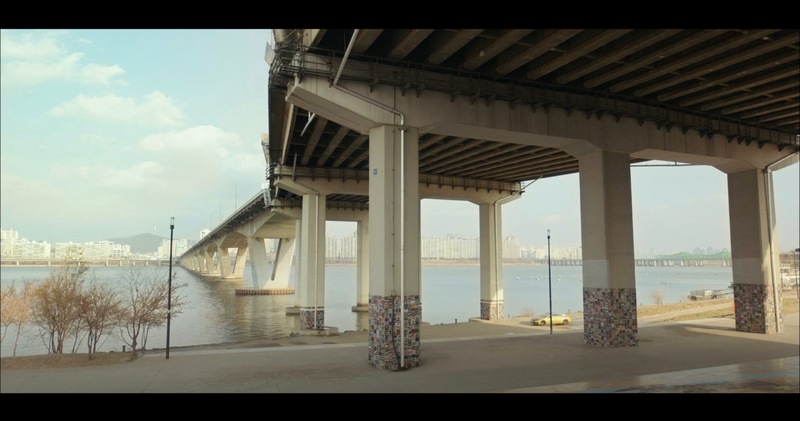 The park itself is located in Seoul’s neighborhood Yeouido-dong [여의도동] in the Yeongdeungpo District [Yeongdeungpo-gu/영등포구]. 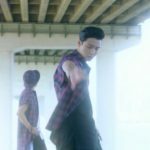 I think this is also included in Reunited worlds. 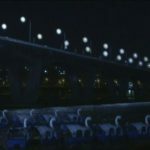 Isn’t this the place where Hae sung and Mr. Cha open up their Pasta truck?